The brakes and brake system should not be ignored on your vehicle. The brake system of your vehicle is one of the many parts that should be inspected on a regular basis. If you notice an issue with the vehicle, and especially the brakes, you will want to bring the vehicle in as soon as possible. This way if there is an issue, we can have it resolved before it turns into a much larger problem. It will also help prevent a costly repair bill when it is time to have it fixed. 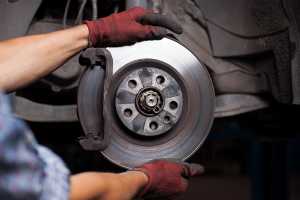 You might notice a thumping noise when or after you brake. This is typically a warning sign that you should have the brakes inspected as soon as possible so we can check the brakes. Sometimes it could be caused by something other than the brakes. There could also be a grinding noise from the brakes. This could mean that the brake pads have worn down, and now it is metal on metal. The brakes could also make a squeaking noise. This can also be caused by the brake pads for the vehicle. The metal flakes in the brake material can be a result of the brakes being applied, even just slightly. The flakes can drag along the rotor, resulting in the squeaking sound. The brake rotors can also cause the noise based on the wear indicator. This is a small metal tab that is fastened to the brake pad. Once the brake pads wear down, this will alert you for when they need to be replaced. If you ignore the issue too long, then the brake pads will become too thin. This can also result in poor safety for your vehicle. The brake pedal can be another indication of poor brakes. If you feel it vibrating or pulsating, then there is an issue with the brake system. Anytime there is something out of the norm with the vehicle, make sure to schedule an appointment with us so we can inspect it for you. This will help keep your vehicle safe and efficient.